BOOKS: Are we raising the cute baby alligator that will ultimately eat us alive? Human beings are strange animals in that they rush hell-bent-for-leather to participate in their own demise. When I was a kid, one of the first things I learned about people and their money is that the most powerful bragging rights come from getting something cheaper than your neighbor got it. Woe be unto the guy at the neighborhood barbecue who paid five cents more for a sparkplug or a hundred dollars more for a new car than the guy flipping chickens on the grill. When economic times are tough, saving a nickel on a sparkplug or a c-note on a car makes logical sense. People are trying to scrape by everywhere they can. In fact, scraping by has almost trumped bragging rights over buying something cheaper than our neighbor bought it for. 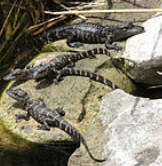 Baby alligators grow up and when they do, their not as cute as they once were. So it is, that on a dark and stormy night, the alligator is wrestled out to the nearest lake or swamp before it figures out, “hey, I can eat the family.” In the wild, it may go off and live a beautiful life or it may lurk around the fringes of the neighborhood where it hunts for pets and small children. One of the first term papers I ever wrote when I got into one of those classes where we were taught how to find sources and use lots of footnotes was about Ida Tarbell and her 1904 book The History of the Standard Oil Company. When Standard put up a new gas station in town, they offered low prices until all the other gas stations went out of business trying to compete with them. Ultimately, the company was broken up even though its remnants, including Exxon in the U.S. and Esso in Canada are doing quite well. Bragging rights about cheap products followed by the need to scrape by have both been powerful incentives for helping build the businesses that ultimately got big enough to eat us alive. 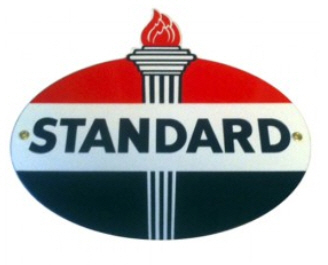 Perhaps Standard Oil is too far away into the past to be a good case in point. Okay, think Walmart and every other big box store that showed up in your home town and ultimately killed all the local businesses. Statistics show that more dollars leave a community when people shop at big box stores than when they shop at the locally owned shops in what’s left of the down town. Few people care because, truth be told, they feel really sheepish admitting that they paid 15 cents more for a gallon of paint at Bob’s Hardware than their neighbor paid for the same paint at Home Depot. And goodness knows, who wants to admit they paid 10 cents more for a pound of hamburger meat at Jenkin’s IGA than they would have paid at Walmart? 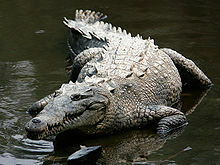 Baby alligators grow up and become angerous. While Amazon has grown up, most people don’t view it as dangerous in spite of the all the charges that surfaced over the Christmas holidays about predatory practices, removing the middle man, wanting to be the only publisher in town, and offering “democratic, be-your-own-publisher” deals to authors who claim “New York Publishers” are a vicious monopoly that won’t let them in the door. But Amazon is selling books at low prices. Isn’t that all the justification we need for helping the cute little bookselling company make its way in a cruel world where everyone wants to scrape by—if not brag about getting great books cheaper than the bricks-and-mortar and other online booksellers are offering them for. Well, as The New York Times noted in a yesterday’s feature story about whether Barnes & Noble can survive, Amazon is now worth $88 billion. It’s almost big enough to eat us alive. When Powell’s books is gone and when Barnes & Noble is gone, will we still be able to brag about lower prices when Amazon is the only bookseller/publisher/distributor in the country? I wonder. And as I wonder, I think about all the people who rushed out to buy gasoline at the Standard Oil Station because it was cheaper than the gasoline over at Bill’s Friendly Service Station. When Bill’s folded up, there was hell to pay, but (what with bragging rights over low prices) the handbasket ride toward monopoly was a heady experience. Bob’s Hardware is gone, too, as is Jenkin’s IGA. In fact, pretty much the entire center of town stands empty. 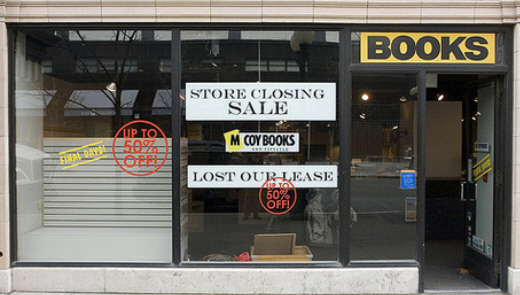 According to that article in The New York Times, we’ve lost 20% of our independent bookstores in the United States since 2002. Sure, the economy has been bad and now e-books are all the rage. When people want paperbacks, there are bricks and mortar and online alternatives to Amazon. When people want e-books, Amazon isn’t the only game in town. But now, by default, they run to Amazon. Will Amazon eat us all alive one day? I wonder. At $88 billion in assets, I guess it can eat whoever and whatever it wants. But maybe it won’t. Maybe everything will be okay as long as we keep our pets and small children inside the house reading the books purchased from the full-grown set of jaws on the edge of the neighborhood. Amazon is a giant, and once they eliminate all other options I bet their prices will increase. That’s what I think will happen, too. Even if it doesn’t, I don’t like seeing so much power being concentrated in one place. 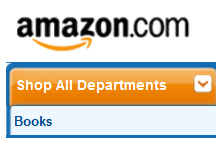 Personally, I very seldom use Amazon. It is like so many other large businesses. At some point folks will get fed up with them and find that there are actually other options out there, some even better. I perceive and interesting phenomenon taking place lately. Many businesses have raised their prices very high and at the same time have cut their quality. Already there are new players making inroads into their business. Sooner or later, somebody will discover where better quality and price can be found. Until then, we’re stuck with that interesting phenomena: paying more for less. It’s good to see I’m not the only one worried about Amazon. Most writers are thrilled with the publishing opportunities Amazon offers, and when anyone voices concern, they say Amazon has done more than anyone to promote book business. But in doing so, they are also destroying the book business. When books are devalued to the point where even the worst piece of crap is considered a book, then we are all in trouble. Amazon has been good for a lot of people. Unfortunately, it has the means to justify the ends it’s looking for. Yes, we are all in trouble.